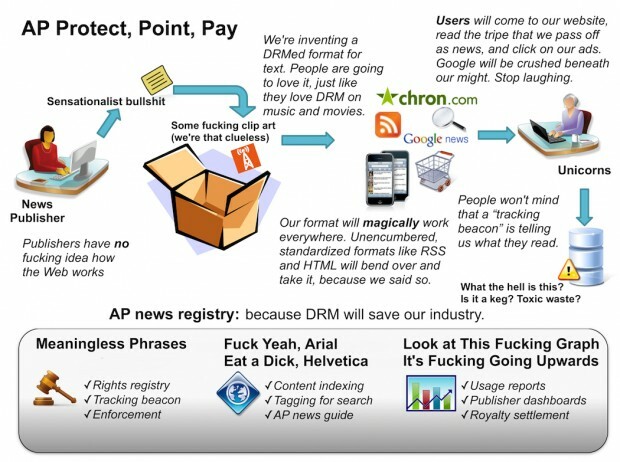 There has been some talk about the Associated Press’ new system, called hNews for some reason, for protecting its precious copywritten materials from bloggers, pirates and pederasts. 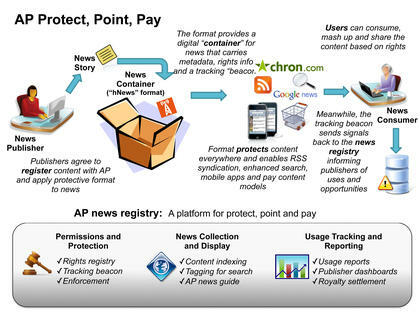 The system will include a DRM system that will make sure you can’t cut and paste data from a browser to a blog post, thereby ensuring that no one can steal the AP’s valuable, value-added content. As I recall similar systems were implemented by websites back in the days of AOL. They didn’t work because you could just view the source code or, interestingly enough, take a screen shot. The system works by putting something into a digital container and then sending to Google or whatever. This same system, as you recall, has prevented the rise of piracy in the music and movie arenas and must be applied to the written word before the Internet fails and we all resort to getting our news from “prophets” who will line major thoroughfares opining on things they believe happened, whether or not they are true. In short, we’ll be stuck with cable news pundits. Seriously: the AP knows it’s in a losing race. I completely understand the value of what they produce. They have been a source of strong reporting for decades. But their vehicle – paying newspapers – is gone. This new vehicle, however, could keep them afloat if they stopped treating the Internet like the Wild West. What the AP is essentially trying to stamp out are splogs. These blogs steal an RSS feed, post the stories as their own, and put up AdSense blocks to score tens of cents per month on impressions. It’s like a general turning his Sherman tank towards a pine tree that is in his army’s way. There are better methods to prevent wholesale theft and most include creating content so compelling that news sources want to pay you to publish them. For example, if the AP told us we could pay 50 cents to repost a good, topical AP story on CrunchGear, I’d jump at the opportunity. I won’t, however, accept a wonky, half-assed DRM solution.